Much acclaimed pianist Brian Kelly, has in his fourth album captured a little of what it is like to simply enjoy life, the moment of creation whether it be through music or living in this eclectic album of neo-classical gems to be enjoyed. Tomorrow’s Daydream is a very definitive piece that sets the stage for what it to come and segues effortlessly into Tracing Rainbows, although the track is a bit more upbeat than the usual tribute to the splendour of the rainbow in its natural element. Perhaps this is not such an unusual meter to describe the beauty of nature as rainbows, in all their glory, are generally to be found after a storm or gentle shower of rain. Fingers tripping lightly over the keys introduces Dancing with the Moon, a track which appeals to the imagination as it is very easy to see a lone figure, bathed in moonlight delighting in the moment, dancing freely, without cares, without limitations. In a more reflective mood Journey Home is a more peaceful composition which in his signature style, at least on this album, builds to a peak before gently slowing and letting go, depicting the traveller, after a long journey finally arriving at journey’s end. Secret Look bursts cheerfully onto the scene with a lovely up-tempo beat which encourages a smile and a little tapping of the toe, before gently shifting into the final piece Before You Go, which is tinged with a little sadness, as the end of this delightful album is fast approaching and goodbyes must be said until the next time. Slightly complex, the piece perfectly captures that moment when it is time to go but one lingers on, stretching out that moment of departure. Kelly’s music background is varied and his ability to shift from classical, to gospel, then add the undertones of a jazz beat, overlaid with a world-fusion style makes this an album that will be enjoyed many times over. Billed as a contemporary artist and solo pianist Kelly’s previous album Butterfly Rapture was nominated for the 2015 Contemporary and Modern Album of the Year, also collecting a silver medal for the Album and a silver medal for the title track Butterfly Rapture. This album has also been nominated for Best Solo Piano Album in the 2018 Enlightened Piano Radio Awards to be presented in Berlin in October 2018. A very vibrant kind of music and definitely one of the few albums that I would place on the top shelf! There’s a lot of promise, variety, and novelty in the album. If you love listening to solo piano, this should be an easy choice for you. There’s a kind of freshness in the songs, and I like the different moods that the artist has tried to bring in, presenting a visual imagery of the song’s theme with sound. The first two songs are my favorite–they just carry a unique rhythm which I could easily relate to and feel connected immediately. There are 11 tracks on the album and Brian has tried to offer different textures to the listener. The control, the innovative approach and the dexterity of the fingers are audible at various places throughout the album–no wonder that Brian’s previous music has also been licensed for various purposes and was received with much admiration. This is the first time I heard his music but I could easily recognize the ease with which he approaches his music–a clear demonstration of his mastery and skill. There’s a certain level of accomplishment for an artist, which once reached, becomes visible (or audible in this case) in the creation and the work of art separates itself from the rest. Brian clearly has reached that level. I will say the album is worth if you choose to spend your time and money. Congratulations to Brian for bringing out this collection and sharing his gifts with the world. Very grateful to have received a generous 5-star review of Butterfly Rapture on Amazon from Grammy® winning composer Ricky Kej! There is nothing like starting the day with music and today I get to sample the delights of Butterfly Rapture by Brian Kelly. The album opens with the lively Piano Escapade, while the tempo is up-beat; there is a real up lifting segment cleverly woven into the composition that creates some beautiful imagery, this is very stylishly performed indeed. Room for Sky, this is one of those pieces that seems to manifest an emotion all of its own, the performance is vast and whilst the tempo is up-beat, it also retains sense of longing and with only two tracks into the release, Brian Kelly has already shown us a very distinctive style, one that at times reminds me of Isadar. The powerful beginning to the album continues, but this time using a wonderful picturesque performance of Flowers at her Feet. I guess my feelings and emotions are still with the loss of Keith Emerson, but on this piece Kelly’s style really reminds me of those magical moments when Keith became the incredible creator of solo segments for the band, this is a really stunning composition, and one of my favourites. Now for something completely different and in fact this almost borders at times on the classical, we now hear a delightful track called Lilac Horizon. This piece is played so beautifully one can almost see fields of Lilac blowing in a gentle summer wind. The next track fits well with the preceding one and is called Chasing a Breeze. However that gentle summer wind I referred to in my last paragraph has now become a frisky early morning Breeze, the energy and performance once more allows our imagination to create a picturesque back drop, packed with vitality. At the half way point we come across a piece called Spiral Moon, the beginning of this composition was so revealing, one could see the moon appear from a late night cloud and then starts beginning to emerge from the heat of the waning day. It’s spring here in Cyprus; there is a glorious sense of colour everywhere and in this arrangement, Hills in Bloom, we see that very sense in the performance from Brian Kelly, this is one track that drifts back and forth as we take in this awe inspiring sight. It’s time for a dedication, as we listen to Niko’s Delight, smooth and gentle tones are carefully and respectfully played, with an elevated sense of energy towards the latter part of the piece, which lead us right into the open arms of the next piece called Playing My Heart, this is one lush arrangement that is also incredibly sensitive and played from that heart centre, the performance is played with a meaningful intent, with a good deal of passion as well; a complex, but entirely captivating track this one. View from the Swing, I love titles like this, makes me feel like I have walked into an art gallery and in a way I guess we have dear reader. Here is a track that seems to reinvent itself from memories past along the way and in a way could be seen as an anthem for happy childhood thoughts perhaps. Brian Kelly has a signature sound that is totally unique and one can really appreciate that most on this piece. We now knock at the last but one door of the album Butterfly Rapture, and listen to the penultimate piece called Winter Aura; it does indeed feel like we have gone through all four seasons during this journey, I listened to this one several times and each time its mournful repose thrilled me, again Emerson in style, but creative beyond belief and so incredibly performed, manifesting a little winter magic with the wave of a hand and a build and progression of complexity like never before, perhaps we have a new genre, Progressive Piano? The last port of call for us the title track itself, Butterfly Rapture. We end with the majesty and grace that the opportunity of a title track deserves, the melody is charming and the performance light, but yet again incredibly skillful and deeply thoughtful. Butterfly Rapture is an album that crosses borders on several genres and even creates new ones, this is one of the most exciting and unique albums I have heard for quite some time and as such I can completely recommend Brian Kelly and Butterfly Rapture as an album you seriously should get as quick as possible. Happy to share this feature article about my Butterfly Rapture solo piano album. The slower, more reflective feel of track 6, “Spiral Moon” provides a bit of a change up from the first five compositions, which are considerably higher energy. I had mentioned earlier about Brian’s experience playing for modern dance classes, and this piece was one that evolved out of that. There is a definite sense of graceful movement here that evokes images of a contemporary dance performance. On “Playing My Heart,” Brian expresses his more romantic side while exhibiting some jaw-dropping technique in the second half. Track 11, “Winter Aura” has an interesting story behind it. As Brian tells it: “I once attended the funeral of a prominent, well-loved Bay Area jazz pianist. Hundreds gathered to memorialize his life and work. That evening, I composed a piece that far exceeded my abilities at the time. My understanding of harmony and voicings took a giant leap forward. It all seemed to come together effortlessly, as if I somehow I tapped into or received a transmission of his musical knowledge. Perhaps I was playing music that he was not able to manifest while he was alive. That night, I became the instrument and music played through me.” The piece has a different feel than other tracks on the album, which I found quite fascinating, and at times brought to mind piano legend and John Coltrane accompanist, McCoy Tyner. The album concludes with a masterful performance on the title track that highlights Brian’s considerable abilities as a composer. 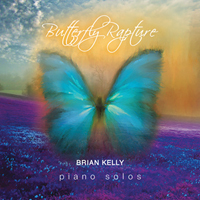 Brian Kelly – BUTTERFLY RAPTURE: It’s been a while since I reviewed Brian’s fine piano work in issue # 86 – and on this outing, it’s all solo piano, which makes for wonderful Saturday morning listening! Pieces like the 2:32 “Flowers at Her Feet” swirl and dazzle your ears. The dozen tunes are, for the most part, quite short… like “Niko’s Delight” (3:20), but that makes them easy to listen to, and I can guarantee that they will have you coming back for repeated listens. What’s most distinctive about Brian’s playing is that the style is “all his”… nothing copied, all original, and vibrantly full of life. My personal favorite of the twelve tracks is “Piano Escapade“… strong chord work and a floating right hand that displays full mastery of the keyboard. I give Brian a MOST HIGHLY RECOMMENDED, with an “EQ” (energy quotient) rating of 4.98 for this fine piano album. Get more information on Brian’s Bandcamp page for this release. Butterfly Rapture is his first solo album and what a magnificent accomplishment it is. Solo piano can, in some instances, feel like a very long extension of the same song but not this album. Each track has its own flavor of music and takes the listener on a journey inside the mind of the artist. From snowy jaunts in “Winter Aura” to the first track “Piano Escapades” where we are first introduced to Kelly’s dazzling style, this album is a many faceted jewel any piano connoisseur will be thrilled to have in their collection. “ Butterfly Rapture is SF Bay Area jazz pianist/composer Brian Kelly’s first album since his 2008 Afterplay and his first solo piano album ever – something I’ve been looking forward to for a very long time. When I lived in the Bay Area, I had the opportunity to see Kelly play live several times and he became one of my favorite live performers. I’ve also worked with him by proofing some of his sheet music, so I’ve gotten to know his music quite intimately and love it. Overall, the music on Butterfly Rapture has an intoxicating energy but also has many quieter, more reflective moments. Kelly started playing the piano at eight years old, so his composing reflects a lifetime in music and feels as natural as speaking. The twelve pieces on Butterfly Rapture are a fascinating combination of classical, jazz and new age influences intertwined to give Brian Kelly a unique and original voice. Butterfly Rapture begins with “Piano Escapade,” a bright and lively piece that (for me) expresses the joy and freedom of getting “lost” in the music. It also clearly indicates that this is someone who really knows his way around a piano! “Room For Sky” has a beautiful flowing quality and combines elements of classical, jazz, and new age piano – a favorite. I also really like “Lilac Horizon,” a lyrical beauty with just the right touch of mystery to make it compelling. “Chasing a Breeze” has a carefree energy that goes in different directions like its namesake breeze would do. Lovely images of an abundance of wildflowers and new grasses gently caressed by a soft wind are evoked by “Hills in Bloom” – warm and soothing. “Niko’s Delight” is a multi-movement piece with a more classical structure that begins with a sweet and simple melody accompanied mostly by blocked chords. The second theme is somewhat more agitated yet beautifully flowing – I really like this one, too! As its title implies, “Playing My Heart” is poignant and sincere, a deeply personal expression – and a very beautiful one. “Winter Aura” goes darker to capture the feeling of winter’s chill. Much of the first half of this piece is played in the bass of the piano, becoming livelier and more percussive and then returning to the original theme – cool! Kelly saved the elegant title track for the end of the album. The various runs throughout the piece are crystal clear and intricate while the smoother and more lyrical passages flow effortlessly. It’s a great ending to a great album! A review by Kathy Parsons of Brian Kelly’s “Pools of Light Solo Piano Songbook”. A CD review of “Afterplay” by Brian Kelly from Dionne Maldonado at WFSS, Fayetteville, NC. CD Reviews of Brian Kelly / Afterplay album from Improvijazzation and the East Bay Express. “Afterplay” is pianist/composer Brian Kelly’s follow-up to his exceptional 2004 debut, “Pools of Light.” Bright and upbeat, “Afterplay” provides a bit of sonic optimism in these days of uncertainty and change. Brian Kelly / Pools of Light CD has been named on Kathy Parsons’ “Best of 2004” List.